I have eaten chickpeas in the form of hummus and felafels since my visit to Jerusalem. Every night we would go into the city and our bus would stop outside this felafel joint. Being a vegetarian at the time, this really suited me. I would start my evening out with a felafel with all the trimmings. This was an oft repeated taste treat on my visits to Cape Town at Ari’s Souvlaki, and on my nights out on the town in Johannesburg at Mi Va Mi. I still opt for a felafel when we go to Anat for a quick lunch and each time I bite into one, I am transformed to the streets of the Holy City. Jerusalem is a mixture of cultures, religions, old and new. It was an adventure I could not wait to have being all of 16! My cousin and my friends and I ate the food of the land, drank Arak by the bottle and went every night to watch the Rocky Horror Picture Show. Now, a few years down the line, I finally decided to see if there was more to chickpeas than hummus and felafel, and to my delight, there is! 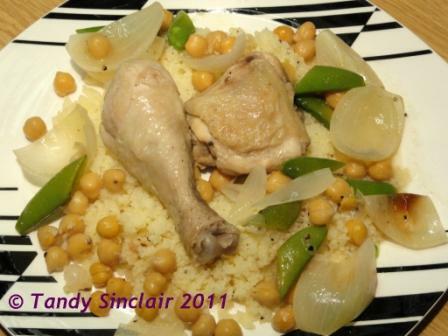 This dish of chicken with chickpeas is it. We’re mad for chickpeas! Friday greets to Dave. Sounds delicious – love chickpeas! Glad I came across your blog, have often seen it mentioned on Mandy´s (The Complete Cook) and am glad I visited! this sounds lovely – I can’t say I have really cooked with chickpeas before, not sure why though. Have a happy weekend and enjoy your new puppy.